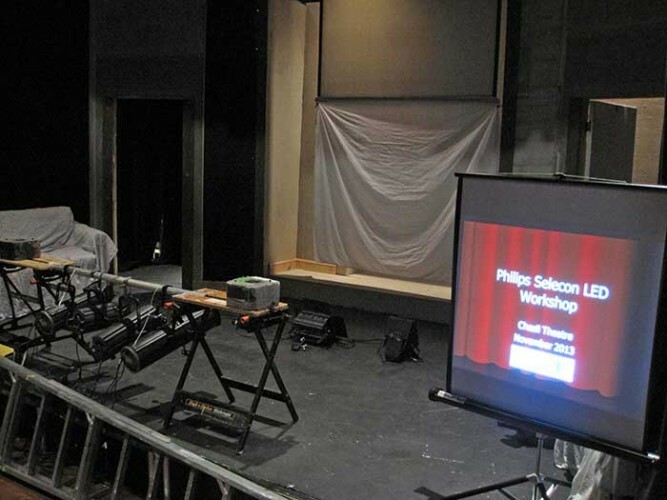 UK - Winchester's 75-seat Chesil Theatre has invested in Philips Selecon's PLprofile1s, PLfresnel1s, and PLcyc1s in an upgrade to LED following an extensive shootout comparing results with its existing tungsten rig. The Chesil Theatre, home of the 150-year-old Winchester Dramatic Society and housed in a superb medieval building, has installed three PLprofile1s, five PLFresnel1s and five PLcyc1s to reduce power consumption and simplify colour changing and control. 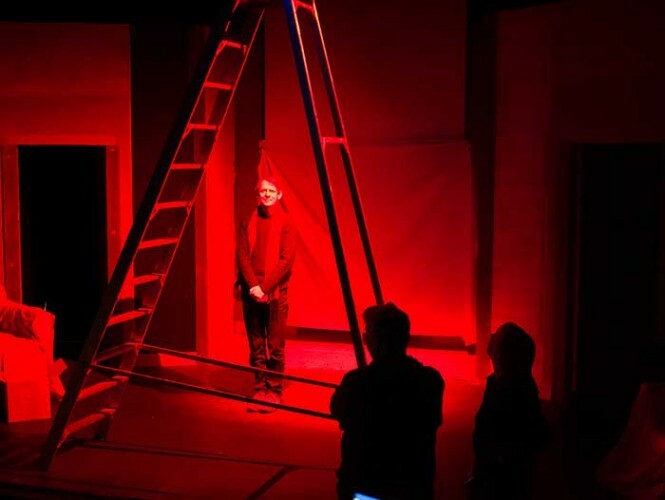 Peter Vincent, lighting manager at the Chesil Theatre, specified the LED Selecon fixtures. "The theatre has a good conventional lighting rig of about 70 lanterns, built up over many years," says Peter. "Selecon's PL range was a logical next step to replace some stock, and complement others. For us, they behave like proper theatrical lanterns with a common RGBW engine, user interface, and dimming curve." However, they also offer the venue many other benefits: "We can now achieve such a wide range of colours which can be selected and changed instantly from the lighting desk. We can therefore spend more time getting the focusing right and can adjust this without the need for gloves as they run almost stone cold! They are also energy efficient and use no more than about 130W with all four colours full on. Not only that we can use the same unit for multiple roles in the same production simply by using a different colour and intensity." Peter and his team were spurred to invest in the Selecon PL range following new pricing levels recently announced by Philips Entertainment on its PLprofile1s, PLfresnel1s, and PLcyc1s, making the range available at prices more associated with their conventional counterparts. "The new Philips initiative on these LED fixtures is a hugely ambitious initiative," Philips' senior sales manager Grant Bales-Smith says. "Our aim is to bring future pricing levels forward and offer them to our customers today - and we're thrilled that smaller theatres such as The Chesil can now benefit from our industry-leading LED technology." As soon as the new equipment arrived the Chesil Theatre invited its five in-house experienced LDs, and 10 representatives from six theatres in the region to an LED workshop to demo its new Selecon fixtures. "The workshop was a practical session: a briefing about what the Chesil was planning to do with the new fixtures and why, then a rigging, focusing and experimentation session," explains Peter. "Everyone was surprised just how good the intensity and quality of face lighting from the Selecon fixtures was. When using them in all the likely positions in our theatre, they worked exceptionally well and met - or exceeded - expectations." 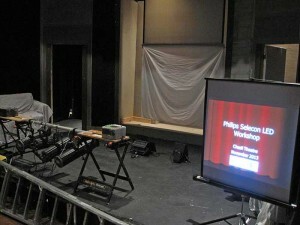 Philips Entertainment's Amber Etra and Bill Richards were at the workshop, to demo the fixtures and answer any questions. "The Chesil Theatre is a wonderful space and the PL1 theatrical series enables the team to expand the colour range within their designs while still using fixtures that offer the same characteristics of a cyc, Fresnel and profile such as using barndoors and shutter cuts," says Amber Etra. "In particular, the cyc lights are able to light such a large part of the space which enables the team to change the mood of a piece with fewer fixtures but still with a great quality of light. Independent events such as the Chesil's workshop really allow technical teams to discover how they can move forward with Selecon LED." The Chesil Theatre's programme runs from classics to new writing, tragedy to farce, historical to experimental. This month, it is showing Noel Coward's Present Laughter.